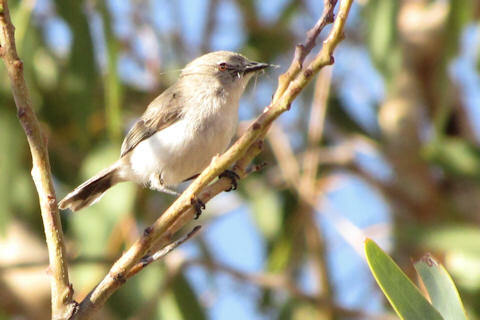 According to the website of ornithologist and bird photographer, Graeme Chapman, the Slaty-backed Thornbill is 'very much a "birdwatcher's bird" only experts find them easily and even then careful scrutiny is needed to separate them from the other two species they often associate with, the Chestnut-rumped and Inland Thornbills'. I don't regard myself as an expert but nor was I actually looking for a Slaty-backed Thornbill when I came across this bird. The eye colour indicates that it is definitely not a Chestnut-rumped Thornbill. Graeme's site also says the Slaty-backed Thornbill prefer mulga with a varied shrub layer such as Acacia, Cassia, Eremophila and Dodonea. It was in such country that I saw this bird for just a few moments in country near the western campground on Newhaven Station, a location not subject to domestic animal grazing. The other bird it is likely to be confused with is the immature Inland Thornbill but this one appears to be collecting nesting material which suggests that it is a mature bird. Newhaven Station in the Northern Territory is owned by Birds Australia and jointly managed with the Australian Wildlife Conservancy.